This originally appeared on the Network in Canadian History and Environment [NiCHE] group blog, Nature’s Chroniclers. Shannon Stunden Bower’s given us permission to repost it here. Southern Manitoba has flooded. Again. Given the large number of notable floods that have occurred in the past few years, this must be a surprise to precisely no one, environmental historian or otherwise. Traversed by both the Red and the Assiniboine, two large prairie rivers that come together at the heart of the city of Winnipeg, the region has a long and well-publicized history of high water. The thing about flooding in Manitoba is that sometimes it doesn’t happen, or doesn’t happen with sufficient severity to attract much notice. Sometimes the flooding is minor for years, even decades, at a time. It can be tempting to think that any period of diminished flooding is indicative of a trend that will certainly continue, effectively extinguishing the risk of severe flooding. So prisons and railways are built in ways that make sense in relation to other considerations. And then any subsequent flood can seem like water out of place, rather than the inevitable consequence of people on a floodplain. So check the ring dykes. Start up the sandbag-making machines. And cue the nervous waiting by evacuated residents. But not everyone is enamored with the floodway. It protects Winnipeg by redirecting the Red River’s water and altering its flow patterns, which can serve to put other places at risk. In 1997, for instance, the operation of the floodway contributed to agricultural inundation in the Rural Municipality of Ritchot and the flooding of 125 homes in the community of Grande Pointe. 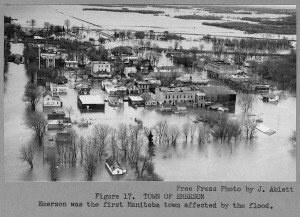 Since the construction of the floodway, there has emerged in Manitoba’s public discourse a distinction between flooding understood as ‘natural’ and flooding understood as ‘unnatural’, unlikely to have occurred had the floodway not existed or had it been operated differently. The floodway might seem to complicate flooding even as it protects many Winnipeggers, displacing vulnerability and prompting debate about who is to blame for water-logged homes and devastated lives. But from an environmental history perspective, and without losing sight of the real human tragedies that hinge on its operation, the floodway also serves to clarify the character of flooding by drawing our attention anew to the human role in the creation of the flood risk. Dr. Shannon Stunden Bower is a SSHRC Postdoctoral Fellow at the University of Alberta.